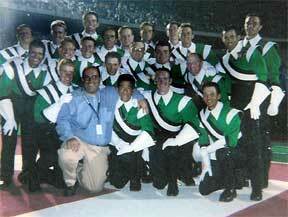 Chris Barnum, a 2002 Cavaliers baritone player, submitted this one: "This is a picture of the 2002 Cavaliers baritone section from finals night in Madison, Wis. The man kneeling in front is our instructor Gale Rask. Although we all have big smiles on our faces, anyone who has been through it knows this is one of the most bittersweet moments of the summer. After spending all summer together, we were all going our separate ways to return back to school or work. Although this group of guys won't be completely together again for a while, or possibly ever, we'll never forget the great times we had together." Thanks Chris! We're running low on Forzato pics! E-mail your submissions -- and we will get to them all, in time -- to dave@dci.org along with where and when the photo was taken. Send some biographical information about yourself as well. We'll give you full credit. Also, let us know if you want your e-mail address included, to get feedback from other drum corps fans.